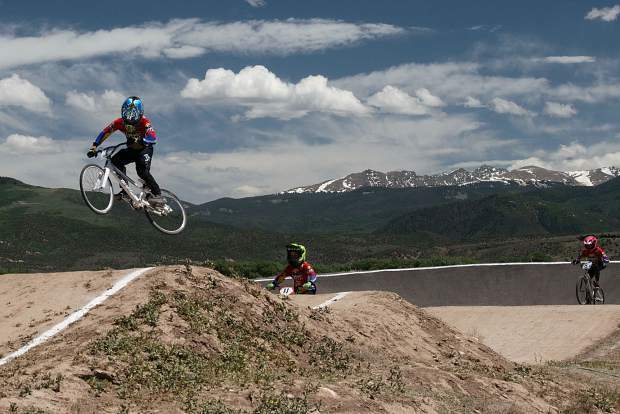 The Eagle County BMX track opened in 2010 and has turned Monday nights into a community experience in Eagle. The regular Monday night races are part of the USA BMX circuit. Competitors come out to the track and attempt to earn points toward the season-long series, which culminates every year in late November at the Grand Nationals championship event. If a competitor enters a lot of events, then they give themselves the best chances at earning a prestigious plate for their bikes, indicating a top ranking. Doublecross Bikes rider Kenny Gustufson, of Parker, won the men’s race. Gustufson said the big crowd made the event even more exciting. On the women’s Alaina Henderson finished first, Addison Finch took second and Sargent finished in third.